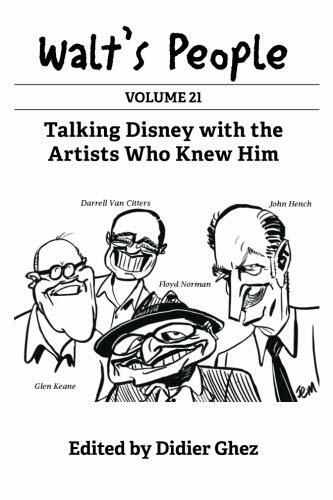 Walt's People: Volume 21 features appearances by Ferdinand Horvath, Ken Peterson, Bob Givens, Sylvia Holland, Tyrus Wong, John Hench, Marc Davis, Alice Davis, Al Kasha and Joel Hirschhorn, Floyd Norman, Paul R. Hartley (via his daughter Stacey Hartley), Bill Cottrell, Lillian Disney, Glen Keane, and Darrell Van Citters. FERDINAND HORVATH provides a unique glimpse into the early Disney studio through his diary and his letters to and from Walt Disney. TYRUS WONG discusses with Michael Barrier his work as a background artist on Bambi and his departure from Disney after the infamous studio strike of 1941. FLOYD NORMAN remembers the idiosyncracies of Disney animator Milt Kahl during their time working on The Sword in the Stone. BILL COTTRELL reflects upon his extensive and varied career at Disney, from his work in camera and story to negotiating contracts and becoming the first president of WED.